Below you can view all the condos for sale in the Clocktower subdivision located in Highlands Ranch Colorado. 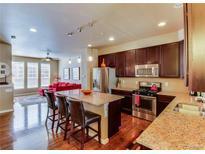 Listings in Clocktower are updated daily from data we receive from the Denver multiple listing service. To learn more about any of these condos or to receive custom notifications when a new property is listed for sale in Clocktower, give us a call at 720-606-6881. Come see this beautiful town home today! MLS#7554851. True Realty, LLC. Full size stackable washer and dryer included. MLS#2851572. Sage Choice Realty LLC. Also included: All Highlands Ranch Amenities, 4 recreation centers, indoor and outdoor pools, Mountain Bike/Running Trails. MLS#8696341. MB PEAK PERFORMANCE GROUP. Highlands Ranch Community Association gives you access to all 4 recreation centers, pools, and endless trails and parks. MLS#8876725. Equity Colorado. Enjoy cooking, doing dishes and grilling while taking in your gorgeous MOUNTAIN VIEWS...this is the perfect HOME! MLS#2268527. Realty One Group Premier. Perfect location - within close walking distance to The Highlands Ranch Town Center where you can enjoy restaurants, the farmers market and outdoor concerts in the summer and the Civic Green Park is just a quarter of a mile away! MLS#8053300. HomeSalesCO, LLC.